Hazard perception skills are important no matter where and when you drive. The need for them never goes away. However, there are some situations where hazard perception skills are particularly vital for your safety and that of other road users. They may not specifically figure in the four most common crash types for provisional drivers (see four most common crash types for provisional drivers), but they are still important. This section summarises these. animals on or near the road. 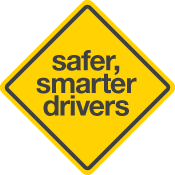 As a driver you still only have the options of slowing down, stopping or changing direction to cope with hazards that you might encounter. The aim of this section is to help you apply these hazard perception skills to some of the specific driving situations that you are likely to come across. 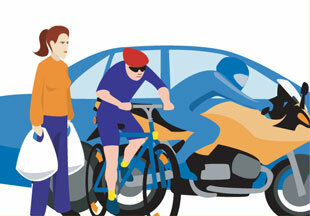 Pedestrians, cyclists and motorcyclists are vulnerable road users. They have no protection in the event of a collision with a vehicle. A crash that leaves only a small dent in your car could kill or injure an unprotected road user. Many cyclists, pedestrians and motorcyclists are killed or injured in South Australia each year. Unprotected road users are harder to see than cars or trucks. So scan carefully for them. After all, you'd want drivers to look out for you when you are walking, cycling or motorcycling. While pedestrians can be found in many places, scan for them particularly around shopping centres, schools, bus stops and intersections. You need to scan the road and the footpath. Look between parked cars where your view of pedestrians, particularly children, can be partially blocked. Pedestrians can be unpredictable and may not cross where it is safe or legal. They are also harder to see than vehicles. You may expect to see pedestrians at crossings and intersections, but may not expect them to emerge from behind parked cars. 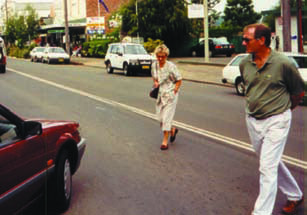 To give yourself time and space to detect and deal with pedestrian hazards, slow down on the approach to areas where you are likely to encounter pedestrians (eg schools, shopping centres). You need to be particularly careful of children and older people. Children can dart out on to the road very quickly and do not have the road sense of adults. 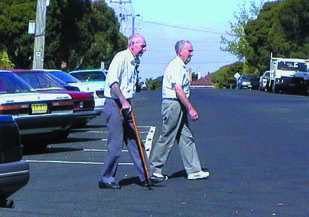 Older people are experienced road users, but they may not be as agile or alert as younger people. This means that they may not look for traffic as carefully and may take longer than expected to cross a road. Give all pedestrians plenty of room when approaching or passing them (eg when making a left or right turn). Try to make eye contact with them to ensure that they have seen you. Sound your car horn if you think that they haven't noticed you. Stop if you need to. Remember that pedestrians will be harder to see at night or when it is dull, overcast or raining. Cyclists use the roads, footpaths and bike paths that may cross roads or run beside roads. Many cyclists, including adults, will move readily from the road to the footpath and back again and may cross roads from footpath to footpath. This can make them harder to see at times. Remember that children aged under 12 years can legally ride on the footpath. But don't assume that they will always ride there and that adults will always ride on the road. You need to scan the road and the footpath for cyclists. Give all cyclists plenty of room when approaching or passing them (eg when making a left or right turn). Try to make eye contact with cyclists to ensure that they have seen you. Sound your car horn if you think that they haven't noticed you. Stop if you need to. Cyclists can generally move faster than pedestrians, but will be a lot slower at negotiating intersections and making turns than motor vehicles. Unfortunately, not all cyclists know or obey the road rules. You may even find cyclists riding against the traffic, riding through red traffic lights and riding without lights at night. This means that your scanning needs to be constant and careful when driving in daylight or darkness. 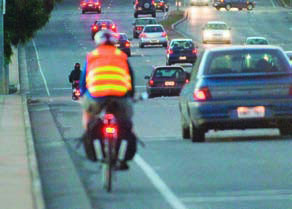 Like other unprotected road users, motorcyclists can be hard to see in traffic because they are much smaller than cars. They also make up only a small number of all vehicles on South Australian roads so can get "swallowed up" by the mass of other traffic. Motorcycles are usually more agile than other vehicles. Most can accelerate faster than most cars and fit through small gaps in traffic. Some motorcyclists take advantage of these characteristics and will "share" lanes with other vehicles and weave from lane to lane even in heavy traffic. This can make them unpredictable. Motorcycles can also be "masked" by other, larger vehicles. For example, you may not know that a motorcyclist is riding behind or beside a truck as the other vehicle completely hides them. This can make them hard to spot in traffic. For example, the motorcyclist in the picture was hidden by the truck only a second before this photograph was taken. 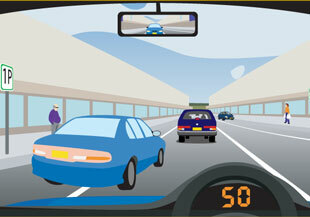 A motorcycle can also fit into the blind spots to the left and right of your car. You may not be able to see them at all without doing a head check. 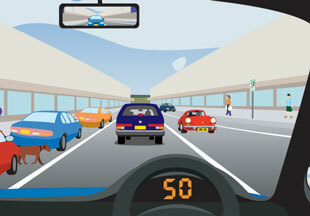 So check your mirrors and blind spots carefully before changing lanes or diverging. In too many crashes involving motorcycles, the other driver claims not to have seen the motorcyclist. This may be true, but is of no comfort to the motorcycle rider. where a turning motorcycle is struck by a vehicle going straight through. This means that you need to scan carefully for motorcycles when you are selecting a safe gap to turn, cross an intersection, pass or overtake. Heavy vehicles such as trucks and buses are usually easier to see than other vehicles due to their size. While this will help you see them, it also means that they can hide other vehicles or pedestrians behind them or beside them. This means it is very important to scan around these vehicles. 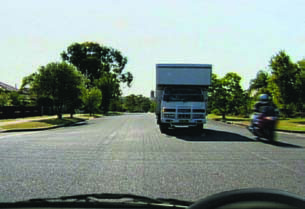 When following a bus or truck you may need to give yourself more following-distance so that you can see around it. The following pictures show how much more you can see at a 5 second following-distance than at a 3 second following-distance at 60km/hour. You have probably noticed that trucks and buses take up more road space and need more room to make turns. Don't try to compete with them for the same piece of road. Give them plenty of room, particularly when they are making a turn or braking. Truck and bus drivers rely on their outside mirrors to see vehicles behind and beside them. If you can't see the mirrors of a truck or bus ahead of you, then the driver can't see you and may not know that you are there. So don't drive in their blind spots. Some trucks have signs on the back warning you not to do this. 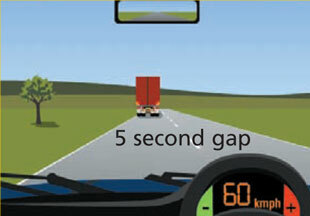 If you are passing or overtaking a truck or bus (particularly a semi-trailer, B-double or road-train) remember that it may be many times longer than a car and will therefore take longer to overtake or pass. 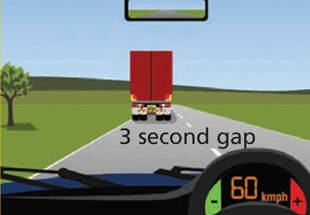 As trucks and buses need more time to slow down than cars, keep a bigger gap between your car and a following truck or bus. This will give the truck or bus driver more time and space to pull up and avoid running into the back of your car. Remember, you are likely to come off second best if there is a collision because the truck or bus may be up to 40 times heavier than your car. Roadworks are often annoying because they slow your journey from A to B. They can also be dangerous places, both for you and the road workers. There is often slow moving heavy machinery, trucks, rough surfaces, no lane markings and workers on or near the road. 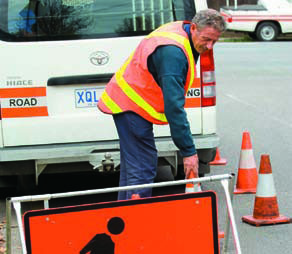 Unfortunately, many drivers ignore the temporary warning signs for roadworks, including the roadwork speed limit signs. This gives them little time or space to detect and react to hazards. This leads to the death and injury of vehicle occupants and road workers each year. Scan ahead for roadwork signs. They are usually placed well in advance of the work site to give drivers a chance to slow down and get into the correct lane. Obey the roadworks signs and speed limits, even if other drivers seem to be ignoring them. Scan for hazards on the way through the work site and give workers and machinery a wide berth. 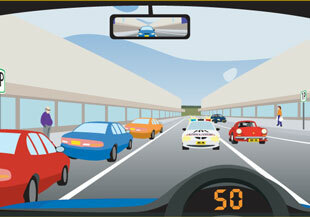 Traffic slows or stops around places where vehicles are broken down or where crashes have occurred. This can be an annoying and frustrating experience because you may be slowed or stopped by vehicles blocking a lane or even the whole road. Effective scanning will help you detect a crashed or broken down vehicle ahead. This will allow you time to slow down and position your car best to get around the obstacle safely. If you need or want to help people who are involved in a crash, make sure that you stop somewhere safely first. You don't want to be involved in a crash yourself. 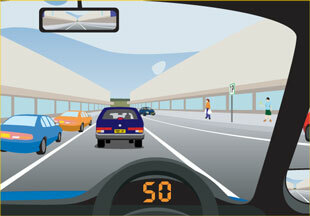 The Driver's Handbook (available at www.mylicence.sa.gov.au) provides information on what to do at an accident scene. You should already know that you need to give way to emergency vehicles that have sirens and/or flashing lights on. But you have to see or hear them first. You won't come across them every day and therefore may not expect to see or hear one. Scanning is important in detecting emergency vehicles because they can appear from unexpected places. They may even be approaching you on the wrong side of the road at high speed. This is why it is important to be aware of what is going on 360 degrees around your car (see Scanning for hazards, p 54). If you think you can hear a siren, turn off the radio/stereo and wind down the window to listen. This can help you work out where the emergency vehicle is. You might have seen numerous dead animals on or beside roads in the city and the country. Animals can be even more unpredictable than humans when they encounter a road. They can also be very hard to see, particularly at night and on dark country roads. Again, scanning is the first hazard perception skill that you can apply to avoid a collision with an animal. This means that you need to scan the road and the sides of the road. Where you know you are likely to encounter animals, it is a good idea to slow down. 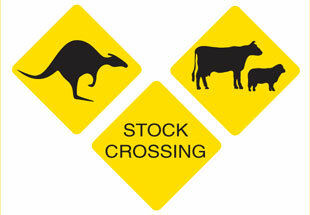 This gives you a better chance of spotting animals moving on to the road and braking or swerving to avoid them. Look out for signs such as these. Things are more difficult in built-up areas where you are less likely to come across wild animals or stock (eg sheep or cattle), but may encounter cats and dogs. Even with good scanning skills you may not spot an animal in time to be able to avoid it. Remember that your safety and that of other humans takes priority. So stop if you can do so safely, or steer round the animal. Your first instinct is probably to try to avoid hitting it. But if avoiding it would mean colliding with other vehicles or pedestrians, or perhaps injuring yourself, it may be necessary to hit the animal. The Driver's Handbook (available at www.mylicence.sa.gov.au) provides information on what to do if you hit and kill or injure an animal. There are no specific practice exercises for the topics covered in this chapter. The hazard perception skills required are the same as in previous chapters. However, you may wish to re-visit the practice exercises at the end of the chapter on scanning as this is perhaps the most important skill for managing these situations.